Huge changes are underway in the automotive industry as autonomous vehicles get closer to becoming reality, forcing manufacturers and suppliers to rethink their growth strategy. Cosworth, a 60-year-old company based in the United Kingdom that has historically made high-performance racing engines, is no exception, says CEO Hal Reisiger. 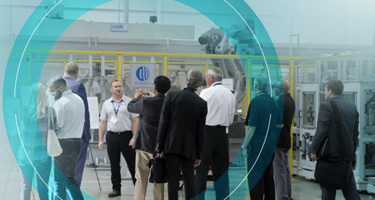 Late last month, Cosworth unveiled its new advanced manufacturing center in Shelby Township, MI, which will also serve as its North American headquarters. Upon completion, the $50 million facility will focus on electronic and powertrain components, sensors, engineering software, and hybrid engine technologies. Reisiger says the company, which has 430 employees worldwide, chose to locate its new manufacturing center in metro Detroit because of the region’s deep ties to the auto industry. Cosworth also considered sites in Indiana, Tennessee, and Silicon Valley, he says. Thirty employees currently work in Shelby Township, and Reisiger expects that number to increase to more than 100 once the facility is running at full speed later this year. Reisiger says Cosworth is currently putting its attention toward designing and developing sensor software and technologies for “perception modules,” which will only become more important in the age of mobility because self-driving cars need sensors to see. The company is building on AliveDrive, its patent-pending system that synchronizes high definition video and audio with data from the vehicle’s internal operating network. Cosworth has changed owners several times over the decades. It was sold to Ford in 1988, and in 2004, Ford sold it to its current owners, the Cosworth Group. Reisiger says that in the future, Cosworth may cautiously follow in the footsteps of other Tier 1 suppliers by acquiring smaller startups for their technical capabilities. Nevertheless, Reisiger says Cosworth sees its future revolving around the new Michigan facility, R&D, and developing its own sensor systems in-house.